A worker was using a hand-held grinder fitted with a grinding stone. The grinder’s guard was removed, as the stone was too large for the tool. The stone’s maximum r.p.m. rating was also lower than the grinder’s. As the worker started to grind, the stone broke, and pieces of stone struck and injured him. A worker was cutting part of a structure with a grinder and a zip cut wheel. The wheel binded and broke, and a piece flew off, striking the worker’s arm. The zip cut wheel was the correct type and size for the tool, and the worker was wearing the appropriate personal protective equipment (PPE). Angle grinders have several functions including sanding, grinding and cutting processes, depending on the type of disc used. When operating, the cutting or grinding disc may come into contact with a body part, or shatter and throw off pieces at extremely high speed. An operator could easily sustain cuts, abrasions, burns or eye injuries. Ensure workers are adequately trained to safely use grinders. Grinders are to be operated within the manufacturer’s stated range of operating speed. Abrasive stones, discs, and wheels should always include complete product information so they can be used properly. 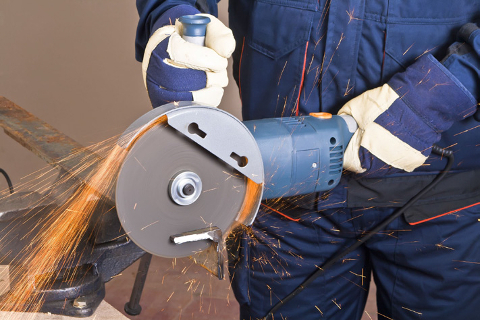 Always wear adequate eye and face protection, such as a full-face shield, when using a grinder. Hearing protection, protective footwear and adequate body covering must also be worn. Allow newly mounted discs to run free for one minute before cutting or grinding. Never apply pressure to stop a disc from spinning. Ensure work items are rigidly supported. Do not use a cutting disc for grinding, and vice versa. Position your body to reduce exposure to flying materials and to shield yourself in case of wheel failure or kickback. Discs should be stored and handled carefully to avoid damage. - Correctly fitted guard and handle. - Worn or damaged disc. Worn or damaged discs must be discarded. - Damage to electrical lead or plug. - Disc selection: The disc must be suitable for the material (steel, masonry, etc. ), the correct size for the grinder (this includes centre hole size), and capable of being used at the grinder’s maximum r.p.m. - Flange and flange nuts must suit the disc and be in good condition.